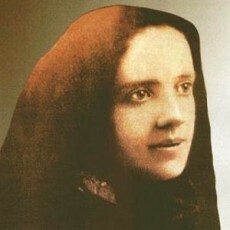 St. Frances was born Francesca Cabrini in Lombardy, Italy. She was one of eleven children from Agostino and Stella Cabrini, who were wealthy cherry tree farmers. Sadly only four of the eleven children survived beyond adolescence. She was small and weak as a child, born two months premature, and she remained delicate in her health throughout her life. She had a strong spirituality as a child, and that grew throughout her adolescent years. Frances took religious vows in 1877 and added Xavier to her name to honor the Jesuit saint, St. Francis Xavier. She soon became the Superior of the House of Providence orphanage in Codogno. She taught and drew a small community of women to live a religious way of life. In 1880, the orphanage was closed and then reopened by her. She and six other women who had taken religious vows with her founded the “Missionary Sisters of the Sacred Heart of Jesus, M.S.C.”. Mother Cabrini composed the rules and constitution, and she continued as its Superior until her death. The congregation established seven homes and a free school and nursery in its first five years. Her good works gained the attention of the Bishop of Piacenza, and of Pope Leo XIII. Mother Cabrini went to the Vatican to seek approval of the Pope to establish missions in China. He instructed her instead, to go to the United States to help the Italian immigrants who were flooding to that nation in her era, mostly in great poverty. “Not to the east, but to the west” was his advice. She arrived in New York City on March 31, 1889, along with her six Sisters. She obtained the permission of the Archbishop of New York, Archbishop Michael Corrigan to found an orphanage, which is located in West Park, NY. Today it is known as St. Cabrini Home, the first of 67 Institutions she founded: New York, Chicago, Des Plaines, Seattle, New Orleans, Denver, Golden, Los Angeles, and Philadelphia. She also established homes in South America and Europe. She became a US citizen in 1909 in Seattle. In New York City, she founded the Columbus Hospital, and the Italian Hospital. In the 1980’s they were merged into Cabrini Hospital. In Chicago, the Sisters opened Columbus Extension Hospital, later renamed Cabrini Hospital in the heart of the city’s Italian neighborhood on the near west side. They both were closed up near the end of the twentieth century. Their foundress’ name lives on via Chicago’s Cabrini Street. Mother Cabrini died of complications from dysentery, at the age of 67 in Columbus Hospital in Chicago, on December 22, 1917. She was preparing Christmas candy for the local Children. By that time, she had founded 67 missionary institutions to serve the sick and poor and train additional Nuns to carry on the work. She was originally buried at St. Cabrini Home in New York. In 1931 her body was exhumed, and was found to be partially incorrupt and is now enshrined under glass in that Altar at St. Frances Cabrini Shrine, in Manhattan. She was canonized in Rome in 1946. Mother Cabrini lived, worked, and died in Chicago so she is considered one of Chicago’s “Very Own”. A national Shrine located in the Lincoln Park area of Chicago, at the former Columbus Hospital. It was solemnly blessed and dedicated in an Inaugural Liturgy celebrated by Francis Cardinal George, O.M.I., Archbishop of Chicago, on Sunday, September 30th, 2012. It opened on Monday, October 1, 2012 and the Very Reverend Fr. Theodore Poplis, Coordinator of Spiritual Services at Chicago’s St. Joseph Hospital and a Priest of the Archdiocese of Chicago, will assume duties as the first Rector of the National Shrine. This new worship space was dedicated with the special mission to foster devotion to the first American Citizen Saint. The National Shrine will play an integral role in the mission and ministry of the Religious congregation, which Mother Cabrini founded, “The Missionary Sisters of the Sacred Heart of Jesus”. St. Frances Xavier Cabrini was the first US citizen to be declared a Saint in the Roman Catholic Church. She was born in Italy, and had the desire to go to China as a Missionary, but the Pope asked her to come to the US instead, to help with the many Italian immigrants. She spent her time mostly in Chicago, and opened up 67 Missionary Institutions to care for the sick and the poor. She founded the “Missionary Sisters of the Sacred Heart of Jesus”, and her National Shrine is in Lincoln Park, Illinois, just opening in October of 2012.